Take action for animals! Help us leaflet at the University of Minnesota between 8am and 2pm on Thursday, September 20. We’ll have a special touring leafleter, Miguel Marrón, from Vegan Outreach. Join us for all or part of this event! We’ll be near the Goldy Gopher statue on the plaza in front of Coffman Union. We’ll give you some leaflets when you meet up with us. 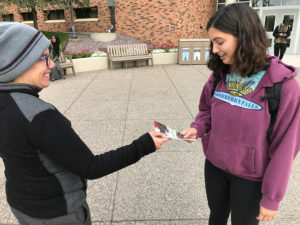 Leafleting is an excellent way to advocate for animals. We reach many people in a short time and have inspiring conversations along the way. Come out and help the animals by educating students about factory farming and vegan food. The leaflet we’ll be sharing is Speciesism. If you haven’t taken our training for effective leafleting, we encourage you to watch this video before you come. No prior experience is required.